Great pillows! Love that these are down and very very comfortable. These were just what I was looking for and wanted in a pillow. I would recommend buying these and would buy them again. You wont regret buying them. This pair of pillows incorporate a cambric cotton shell with double needle edges with German piping. Filled with 650 Fill Power Hypo-Cycle white down, this uniquely hypoallergenic product meets all state and U.S Department of Agriculture (USDA) regulations. The down used in this product has been certified to the RDS standard by Control Union. Available in Medium and Firm Density Standard, Queen and King Sizes. Medium Standard: 20 inches wide x 26 inches long / 16 oz. Medium Queen: 20 inches wide x 30 inches long / 19 oz. Medium King: 20 inches wide x 36 inches long / 24 oz. Firm Standard: 20 inches wide x 26 inches long / 20 oz. Firm Queen: 20 inches wide x 30 inches long / 23 oz. Firm King: 20 inches wide x 26 inches long / 30 oz. Spent quite some time to find the right pillows for my needs. Not disappointed. 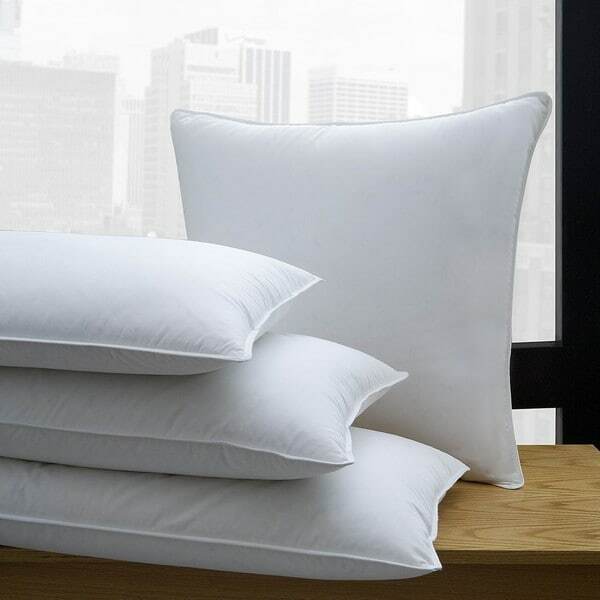 Pillows are well done, feel firm for a down pillow- exactly what O was looking for. It is duck down!, excellent quality. Great addition for my guest room. Shout out to the prompt delivery, kept on schedule, just hours before the storm hit! Great pillows for guest room or even treat yourself too. Very fluffy and soft. They are affordable enough to gift to that someone who is extra special who you want to pamper! Very nice. Not as full as I’d like. But they will work. Kind of have an odd smell. But I’m sure washing them will help. They are very good quality and is definitely recommend them! Less filled than some, but great for sleeping on my back. Love them! Great value! Happy with the purchase! These look amazing! I'm going to buy some now! I needed 2 100% down firm pillows appreciated the discounted pair price vs individual price. They look amazing! Going to buy some now! Good reviews. I was looking for quality pillows.